Here’s a question I get every so often---and it’s a good one. “Where do essays and proofs come from?” I will do my best to convey to you the history of how these fascinating bits and pieces of paper reached us and have traveled through the philatelic mainstream. The source of all essay and proof material was either the portfolios of bank note engravers or the actual files of the bank note companies. How this material reached the philatelic marketplace is the subject of this column. It was customary for bank note engravers to retain examples of their work. They were, first and foremost, artists and artisans. Just as their sketch books were a depository for their artistic thoughts and ideas, their portfolios contained examples of their works-in-progress and finished creations. These portfolios were a great source of pride for the early engravers. Rarely would a portfolio leave the family upon their death. They would be passed on to the next generation, which in many cases would also be engravers. It was not until the early 1930s that many of these portfolios entered the philatelic marketplace. The man who pursued the work of these men of the 19th century was Dr. Clarence W. Brazer. Clarence Brazer was an artist himself, a practicing architect, with many building designs to his credit when the Great Depression struck in 1929. Brazer soon found that his commissions were drying up and he needed to support himself until the economy rebounded. He soon found himself dealing in stamps and pursuing essays and proofs. Postage stamp design and production intrigued him and he started to collect as well as deal in them almost exclusively. By studying the Post Office Department archives in Washington, D.C., he was able to learn the government’s side of the story about the evolution of the various series of postage stamp issued during the 19th century. The bank note company letters to the Post Office Department, found in the archives, provided a source for the names of the men who had been involved in the physical creation of the designs and engraving of the stamps. Brazer used genealogical skills to track, in some cases, the actual retired engravers or their heirs. Being an artist of sorts himself he was able to meet these people on their turf and communicate on their plane as artists. Since he was one of them he was able to persuade and cajole many an engraver or heir to part with some or all of their portfolios. Because of his love of the subject and postage stamp design, the marketplace today has been provided with many rare and unique examples of the bank note engravers work. This practice of acquisition was not unique to Brazer. In fact it has continued on other levels since his death in 1956. As an example, the portfolio of Charles Brooks, who worked as a vignette engraver for the Bureau of Engraving and Printing, was sold by the firm of Jacques C. Schiff, Jr. The Brooks portfolio was brought to the Schiff firm by an engraver who Brooks had mentored and to whom he left his portfolio. 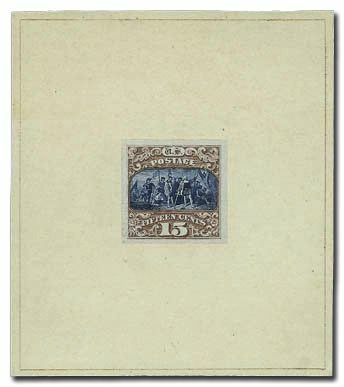 It is the source for many of the large die proofs of U.S. commemorative stamps issued in the late 40s and early 50s. Most all of these items are unique. As an interesting aside, this man found my website earlier this past year, we met at the Plymouth Stamp Show and he sold me the non-philatelic portion of the Brooks portfolio. When I asked him why he was selling the Brooks portfolio he told me that the consolidation in the bank note industry and the technological developments in printing were forcing out the engravers and, thus, the art was dying out. His tragic story points to the fact that this craft will probably pass from existence, at least in this country, in our lifetimes. A second example occurred just a few years ago when the grandson of J. C. Benzing, a vignette engraver at the Bureau, sold his late grandfather’s portfolio at auction through the firm of Robert A. Siegel Auction Galleries, Inc. The Benzing portfolio contained many proofs from the 1920s and 1930s including a set of Graf Zeppelin die proofs. I believe that there are still many portfolios lurking in the woods waiting to be found. Based on the fact that this art form is fading, and these portfolios are separated from the original engraver by anywhere from two to five generations, you will see more of them reach the marketplace. In the next issue of this magazine I will finish this story. Both the raid and the release of the files of the bank note companies comprise a compelling and interesting story and will undoubtedly mean a much larger column than normal. As a closing note, I would be remiss were I not to comment on a longstanding and rather puzzling dichotomy in our philatelic hobby: although essays and proofs are clearly the most beautiful products of stamp production, they have never achieved their rightful popularity in our hobby. What’s your idea on why this is?